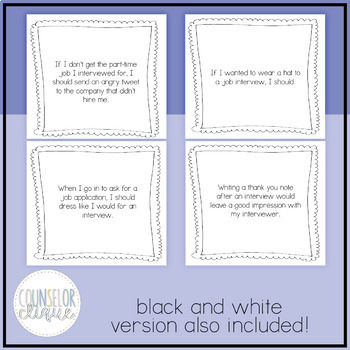 This product, by Counselor Clique, is Job Interview Situation Sort. 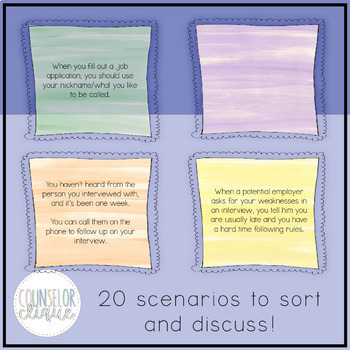 Job Interview Situation Sort is a career activity suitable for students in grades 9-12 (regular education or special education). 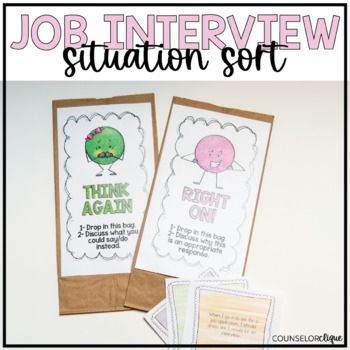 This download comes with 20 situational questions about situations dealing with job interviews in PDF format (color and black and white versions), two paper bag labels titled "THINK AGAIN" or "RIGHT ON!" (color and black and white versions, and a PDF pre/post assessment to collect your perception data. 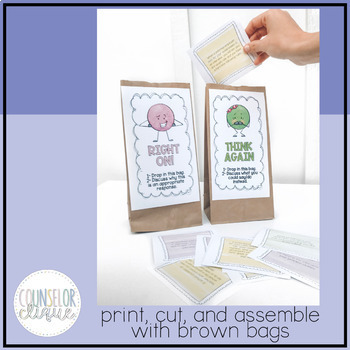 (The Career Self Efficacy Pre/Post Test is sold separately here if you don't want this entire activity!) Download this 15 page product and follow assembly instructions. Students will be engaged with each other and the material as they think critically about interviewing for a job. Is This Aligned with the ASCA Mindsets and Behaviors? YES! M 6 and B-SS 1. If I like this activity, what other career activities should I check out? Check out my Career Building Blocks Game which is my best seller. It also includes the Pre/Post test, activity, and lesson plan. Also check out my Career Day Conversation Card that you can pair with a career day, career fair, or lunch and learn! Check out my Twitter, blog, Pinterest, and Instagram!